In a recent press release, Nintendo of America finally revealed the release date for one of the first of its anticipated 2011 lineup. 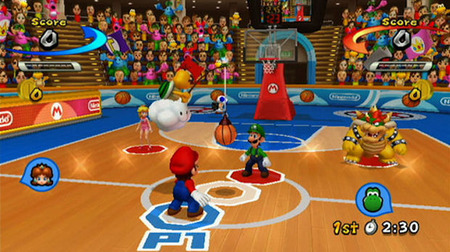 Mario Sports Mix debuts Feb 7, and will feature four frantic sports: volleyball, basketball, dodgeball, and hockey. With most of Mario’s other big sports releases, from Mario Golf to Mario Tennis to Mario Strikers meeting with general success, I must say I’m looking forward to what a four-in-one offering will bring to the table. Interesting to note for Zelda fans is the February release date. With Nintendo’s track record of spreading out major releases and the latest word on the street citing Skyward Sword as just “over half complete,” it’s seeming less and less likely that we’ll see the game in the first months of the new year, let alone in time for the series’ 25th anniversary on Feb 21. Luckily we’ll have some Mushroom Kingdom dodgeball and the 3DS to look forward to in the meantime. For the full press release, follow the jump. MarioTM has a long history as a sports fan. Throughout his storied career he has pursued an interest in golf, tennis, baseball and go-karting, to name just a few. Now Mario’s tackling four different sports at the same time, all of them included on one disc for the WiiTM console. The game MARIOTM SPORTS MIX lets players jump into games of hockey, basketball, volleyball or dodgeball. The game launches on Feb. 7. MARIO SPORTS MIX presents these four familiar sports – but with a Mario twist. Players can choose from a variety of playable Mushroom Kingdom characters and can even challenge Mario and friends directly by playing as their own MiiTM characters. Each game contains a number of Mushroom Kingdom power-ups that can turn the tide of a game in an instant, such as banana peels, green shells and even mini mushrooms. In over-the-top Mario sports fashion, each character can unleash his or her unique special move that ranges from Mario’s fire dunk in basketball to Yoshi’s rainbow attack in dodgeball. Players can also elect to hold their matches in a number of interesting venues. For example, the Wario Factory has conveyor belts that affect how the players move on the court, while in Peach’s Castle, fountains go up and down to block certain areas of the net in Volleyball. Up to four friends who are in the same room can join in the fun, while up to four players (one or two at each location) can compete over a broadband Internet connection via Nintendo® Wi-Fi Connection. Players can play online against friends with whom they have traded friend codes, or anonymously against other opponents. Multiplayer modes require additional controllers, which are sold separately. For more information about MARIO SPORTS MIX, visit http://mariosportsmix.nintendo.com.